This interview was conducted by Aletta Brady on April 12, 2017. Katy Bullard, Alex Cohen, and Marisa Granados also contributed to the production of this story. “We live here in Minnesota and, of course, people might be tempted to assume that we’re somewhat insulated from climate change because we’re smack-dab in the middle of the continent. Rising sea levels are not an immediate concern for us. Maybe folks in Minnesota might appreciate the prospect of shorter, milder winters. But, one of the joys of coming across our state as you make your way northwards is that the maples and the oaks give way to the pine trees. When you get a hint of pine in the air, you know you’re entering the boreal forest. And here in the boreal forest, we look alarmingly at the diminishing firs outside our windows as we watch the effects of climate change every year. It’s particularly pronounced in the beloved area where I live, in the Boundary Waters Canoe Area Wilderness, a beautiful place with ponds and lakes all clean enough to fill up your cup and take a drink from. You can’t drive through it, you can’t waterboard in it, you can’t snowmobile across it, and you can’t even fly over it. It’s one of the few flight ceiling zones with an extreme degree of protection in the United States, shared only with a couple other spots, including the White House. Since it’s a heavily protected place for wilderness, a couple hundred thousand people come to enjoy thousands of miles of canoe routes each summer, and another couple thousand come each winter to enjoy those same routes by dogsled. That’s our livelihood here. People from all over the world come here from December to March to enjoy the winter world by dogsled, and the guests provide the livelihood for my family. We’re very grateful to call this place home and to have carved out a home in this lovely, lovely area. I never set my sights on doing this from the get-go, having grown up a city boy in Minneapolis, but it just kind of fell into place. When I was eight or nine years old, an organization called Lutheran Pioneer Boys—sort of a Protestant take on Boy Scouts—took me on a canoe trip up in the great north woods. Off we went on our first canoe trip in the Boundary Waters. It was a life changing experience. One evening, when we were camped out on this place called Lincoln Island, I was in my pioneer boy green shirt and my red kerchief with all of my medallions marking my accomplishments. We were playing kick the can around the campsite and I remember, in the middle of my antics with my friends, gazing up at the amazing scene around me and being seized by that moment. I knew right then and there that somehow, some way, I would call this place home someday. I think it was the purity of the place and the fact that the entire ecosystem was fully intact. I was intrigued with the presence of wolves and that the Boundary Waters had the largest viable population of timber wolves in the continental U.S. I was affected by that as a child, seeing the entire web of life fully intact and healthy. That was a very rare, special experience. After that, every moment through high school and college, I could see my way towards a livelihood that lent itself to life up here. And, in our college years, way back in the late 70s, government protection of the Boundary Waters was a hot-button political issue in Minnesota. So, I jumped into the fray fighting for the Boundary Waters with my buddy, Greg, a close friend from college. He has a minor congenital disability and had an interest in issues involving people with disabilities. We joined forces because one of the big debates during the Boundary Waters battle in the late seventies was that motor proponents argued that you denied enjoyment of the area by people who are disabled by disallowing motor boats. And Greg and I both felt that it was a red herring; we understood from our friends who were disabled that they enjoyed visiting natural places just as much, maybe more, without any pandering that they would need motorboats or snowmobiles or airplanes to get out and about and have a wilderness experience. We invited a circle of friends who had different disabilities—who were blind or deaf or using wheelchairs or crutches—on a Boundary Waters canoe trip and cajoled a reporter from the New York Times to join us in hopes that we could make some political headway out of the trip. And it all clicked. The trip was a magical experience, a wild and crazy adventure on the trail together. Being on the trail with a guy who had lost his legs in Vietnam and a woman who had been blind at birth made for very interesting campfire chatter and experiences on the trail. The New York Times writer wrote a beautiful front-page piece that helped move the dial on those political battles. But first and foremost, the experience was riveting for me and Greg because it was so much fun, so interesting, and a unique way to enjoy a wilderness experience with a circle of friends who came from very different walks of life. So, around the winter of ‘79, we went to Ely, Minnesota, asked around, and found our way through the winter woods to a guy with a cabin tucked way back on the edge of the Boundary Waters. He had a dog team as a matter of course to make his way fifty miles back-and-forth to town for supplies. Greg and I laid out our wrap to him about wanting to try a wilderness trip for people with disabilities and he was all for it. We came back a month later with a group of friends and he had crafted a whole fleet of specially-adapted dogsleds for people who were disabled, with bucket seats and hand controls and sleeping bags for people with circulatory issues, and off we went on a seven-day winter trip in the wilderness. We got the full Monty—the northern lights, the howling wolves, and most importantly, the mystique of traveling silently across the snow-scape with these dog teams. That was that for me and it’s been dogs in winter ever since. The Boundary Waters are so much wilder in the wintertime. The wildlife is much more conspicuous as well. It’s not that you’re necessarily seeing wolves or moose or lynx every day, but you’re seeing their tracks every day so you’re well aware of their presence. And with the foliage down from the trees, you have a much longer distance you can look into the forest, so it’s actually like a much wilder place. The winter adds an element of intrigue for me because of the heightened sense of extreme—both in temperatures and in the margins of life systems. My personal affinity for adventure is dramatically heightened. And then, of course, there’s the joy and intrigue of being with sled dogs whose own energy and energy for being out there can’t help but feel contagious. Sue, my wife, came on one of our early Wilderness Inquiry trips to see who would accommodate her residents at the long-term care center where she worked. Many of her residents were young guys who had been fishermen or hunters but had broken their necks in motorcycle accidents and still wanted to engage with their outdoor interests. She became our first guide, and eventually, Sue and I moved in with wilderness explorer Will Steger on his homestead here in the Boundary Waters. He was starting his fledgling business called Lynx Track Winter School before he launched into the Arctic and brought us along with him. 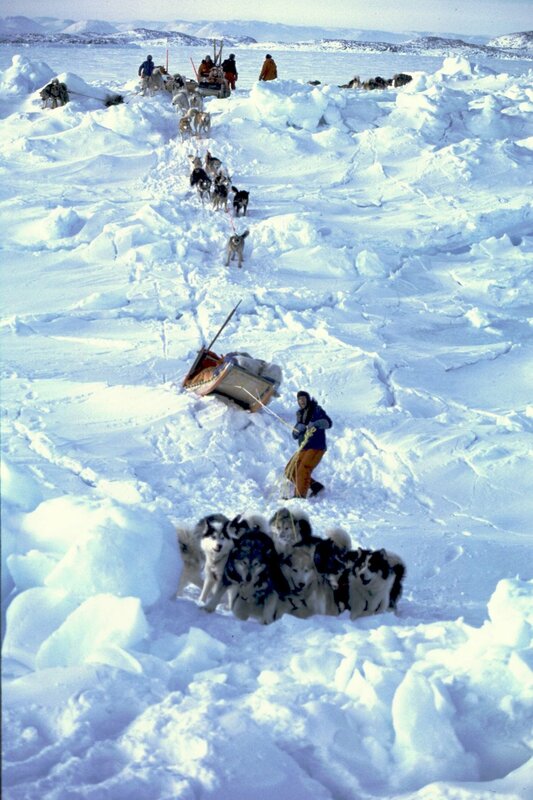 We went on a series of Arctic expeditions culminating in a particularly big, high-profile project that took us to the North Pole by dogsled in 1986. And with that, we were able to leverage the success of the trip to buy our own expansive property in White Iron Lake, and Links Track Winter School became Wintergreen, which we have now. I still go to the Arctic every year. When winter wraps up in Minnesota, we extend the snow season by heading further North. When we travel to the Arctic by dogsled, we’re partly on skis because we enjoy doing it, and partly because it’s our only way to stay warm. The temperatures often go well below zero and, on the back of a dogsled all day, it can get pretty crisp and uncomfortable fast. So, we try to ski to stay warm. I don’t do heat very well—maybe it’s just a personal thing of my own metabolism—but I really thrive in a cold setting. I know a lot of people might not share that affinity with me, but I have that going for me in terms of my Arctic interests. I do very well in cold settings and never have much trouble keeping my fingers and toes warm, so that’s a bonus. Most folks probably assume the Arctic is just an expansive whiteness with a little extra sparkle to it, but in fact, it’s really quite beautiful, with low-lying sun casting rainbow colors through the ice blocks there. And when the wind sculpts the sea ice, particularly in the fjords full of icebergs, it encourages all kinds of magical shapes. It really is a theater of light out there. A photo from a launching expedition. In the Arctic, the effects of climate change are much more pronounced than in Minnesota because the further north you go, the more advanced the impacts are. There’s a number of reasons why it plays out that way, but it all culminates at the North Pole, which is truly ground zero for climate change. The impacts of climate change at the pole provide data to model the impacts that are likely to be felt further south here in the decade ahead. It’s very much in-your-face visible when you’re in the Arctic. Going up there, we’ve seen the impacts on the wildlife, especially with the iconic animal of the Arctic—the polar bear. They’re marine mammals. They spend around 99% of their life on sea ice, hunting seals, their main source of sustenance. Without ice, they have no food. With the diminishing sea ice, their hunting grounds are rapidly floating away. This also impacts native people who call the Arctic home and are dependent on hunting animals like seals and walruses. As the sea ice has diminished, and polar bears move further away from land, the opportunity to maintain those cultural practices has diminished as well. It’s sad to see communities that have proudly maintained native foods become increasingly reliant on food supplies brought from the outsides. Paul meeting his wife, sue, and their baby after finishing a North Pole trip. We have had to adapt our routes now because we know that the trail will be more dicey than it had been in the years past. The ice becomes questionably deep in the Arctic, so we rely largely on a connection with native hunters who are out there every day and know which areas remain safe for travel and which don’t. We consider route options together before we head out on the trail to make sure we’re not taking ourselves into compromising situations on the ice. It’s been really heart-wrenching for us, year by year, to go up there while folks here are still humming and hawing, wondering if climate change is happening and why. There’s no such wondering out in the Arctic. Everyone is fully reconciled to the fact that climate change is well on its way and is just scrambling to adapt. When we run trips back in Minnesota, the first evening is an orientation where we discuss comfort and safety concerns. Then, we do what we call our Dog Sledding 101 class, where we go over the basics of what’s involved in learning how to handle the dogs and the sleds. Then, the moment arrives where all the teams are packed up and ready to roll, and we pull the ripcord and they rocket off the ice on a training run with their dog teams. Groups dogsled on a variety of trails through different scenery, different levels of challenge, and with different historical and ecological sights along the way, depending on their package. Sometimes they circle back to dinner here at the lodge or they camp out in the Boundary Waters. We host about 700 folks every winter on 100 different trips that last anywhere from a half day to multiple weeks. It’s very hands on. Everyone is driving their own sleds, but they’re accompanied by our guides who are traveling beside them on skis to help out when needed and provide tips to folks regarding their mushing skills. Our dogs are a pretty specialized breed. They are called Canadian Inuit dogs, the oldest domesticated canine. Their genetics are closer related to the wolf than any other domesticated canine. I worry for my kids and grandkids because I know that the Boundary Waters, and their iconic reverence here in Minnesota, are destined for dramatic change, and we’ve got to wrap our heads and hearts around that. We have to reconcile the things that can be done to adapt and realign to accommodate that. In the long-term, the heartbreaking element for me is that changes are occurring with sufficient speed such that, as much as I’ve enjoyed my career in Arctic adventure travel and operating a dogsledding operation in the Boundary Waters, I would never encourage my children to follow in my footsteps and do the same. I don’t think this will be a viable career a decade or two from now, or maybe even sooner. In these dark, strange, political times, the most important thing is to stand up and be counted as standing with the science that has illustrated that climate change is poised to wreak havoc on the destiny of our planet. First and foremost, the obligation that all of us have is to recognize that progress can no longer be assumed. Some of us may have been complacent in recent years thinking that things are moving slowly but steadily in the right direction. But it’s time for all of us to take a forceful position and stand up for the obvious truth of the matter and the actions that need to be taken to correctly adapt to it. 1) Share Paul’s story on social media and with your network to amplify his voice! 2) Follow @savethebwca on Twitter for updates on how to support their organizing work. 3) Tell Congress to defend the Boundary Waters. Message elected officials now! 4) Double your impact - donations to Save the Boundary Waters will be matched in March only by a generous anonymous donor!